I have been reading your website on the Lundy case with interest. At the time of the incident I was living in Palmerston North and as the crow flies a short distance from Karamea Crescent in Kelvin Grove. At the time I was working in Wellington daily and I would drive from my home to central Wellington and back each day. Each morning I left home at 5:30am and driving down Tremaine Ave to Opiki, through Shannon, bypassing Levin via Kimberly Hospital and then take the main route through Otaki and on to Wellington. Most of the time there was a build up of traffic from the Paremata roundabout all of the way into Wellington and I rarely made it to work before my 7am start time. I know it took me over an hour and a half each morning with pretty clear roads as far as Paraparaumu for the most part. 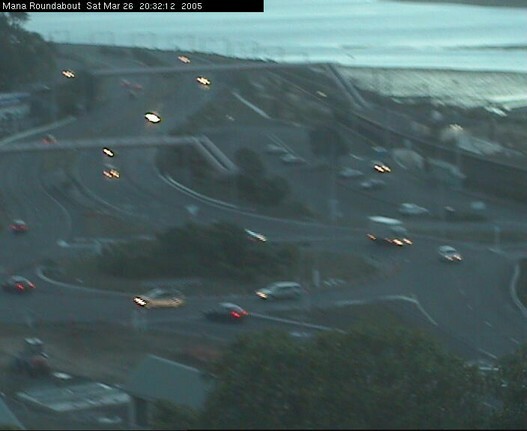 Here is a photo of the Paremata roundabout at 8:32pm pm on 26-3-2005, as several webcams operating - Webmaster, lundytruth. On the way home I always tried to get away from Wellington by 4:00pm to avoid the build up of traffic at the Paremata roundabout but rarely did I make it through there without a lengthy wait. More often than not I missed the start of the 6:00pm News and most often it was closer to 6:30pm before I actually made it home. Occasionally I was delayed leaving Wellington and I would leave there after 5:00pm and I couldn't make it home to Palmerston North in under 2 and a half hrs. Occasionally I would take the commuter train from Wellington to Palmerston North if my wife needed the car and on those occasions I would look at the lines of traffic backed up to the lights at Porirua waiting to get through the Paremata roundabout and be grateful that I was not sitting in all that traffic. 1. I did this trip almost every day for close to 15 months from the end of 1999 to the middle of 2001. 3. The fact that the New Zealand police wouldn't attempt the trip in similar traffic conditions as those that would have been present at the time Lundy was alleged to do it, is a clear indicator that they would not have been able to present a plausible case to the jury as their results would not have been in their favour. 4. At the Paremata roundabout there are web cameras that record the traffic flow and anyone can see that every day there is a major traffic bottle neck there between 4:00pm and 6:00pm each and every day. 5. The road around the coast line from Pukerua Bay to Paraparaumu is not suitable to be travelling at speeds of 140 to 150 km/hr even if there is no traffic at all unless you are a very skilled and competent driver and in a car a lot more suited to high speed than Lundy's Ford. 6. At the time of this incident there were road works on the road between Paremata and Pukerua Bay and the speed limit was 70 km/hr for some distance. There were also road works on the North bound lanes of the speed strip going into Paraparaumu from McKay's crossing and the speed limit was 70 km/hr. 7. The road between Shannon and Palmerston North is not suited to high speed unless one uses the Opiki route but once you enter the city either via Longburn or Tremaine Avenue, speed is a critical factor in getting to Kelvin Grove. I lend you my support, if he did do it, he deserves all he gets but if you want to prove he drove that distance at that time of day or evening in those times, you need to be stretching your imagination fairly well to the point of extreme exaggeration.